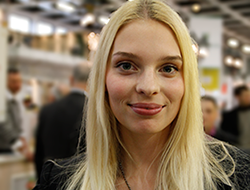 - Book a Hostess for free for each new Exhibitor member! By suggesting HC to other non-member Exhibitors, you will receive 1CP (Credit Point)(*) valid for booking 1 Hostess. The new Exhibitors have to use your User-ID number when registering. Inside your account you can find the direct link to send invitations via email to your friends. The offer is restricted to Exhibitor registrations. (*) Credit is added upon completion of first credit purchase by the referred new member. There are no registration costs for both Hostess and Exhibitor subscriptions. HostessChannel services are free of charge for Hostesses. As an Exhibitor you can search into the Hostess database at no extra cost too. However you have to buy Credit Points (CP) if you wish to proceed contacting Hostesses. 1CP = 40€ are spent to book each selected Hostess. Credit is represented as whole points. One Credit Point (1CP) costs 40€. There is no minimum number of credit points to deposit, however no fraction of credit points is admissible. This means credit can only be paid in 40€-units. Pre-paid credit is purchased with safe, easy global payments and the HostessChannel Guarantee. Credit is only used if booking requests are accepted by the chosen Host(s). This means if an Exhibitor is looking for 3 hostesses for the duration of a 5-day event but only 2 hostesses will accept his offer, then the credit amount actually spent will be only for the 2 Hosts who accept the enquiry. Also note that the event duration does not contribute to the price calculation. - 2(hostesses) x 8(hours) x 10(€) x 5(days) = 800€ ! hence with HostessChannel the Exhibitor has the possibility to reduce his expenses due for the middleman fee up to 90% and over(**)! Note that Exhibitor's credit is spent only when the chosen people accept your offer. In addition the agreement on the hourly pay is already met since it is included in the request form when selecting the Hostess so the whole process is very quick. Please note that the credit must be sufficient to cover the number of desired contacts in order to send the request(s). Moreover there are obvious advantages for Hostesses too since if they were using an agency their pay will be fixed by the agency and it will be just a fraction of what they earn from Exhibitors. - The price is independent from the number of days the hostess will work for the exhibitor. - There is no specific time limit for using the remaining credit as long as your subscription is still active. - The Exhibitor's Credit is not used to pay Hostesses directly, this is to be settled by the Exhibitor to the Hostess independently from HostessChannel. - All prices are shown net of VAT. VAT not applicable. (**) the calculation assumes a 8-hour working day for a 5-day event. However the saving will increase even more with the duration of the event. Get the advantages of the community, register for free!